While some people appreciate the little things their parents do for them, others just neglect the effort. If only children, teens, and those depending on them know what it is like to be a parent, they would not dare to have children or become a parent in the future. 1. Parents have the role of providing the needs of their children, especially food, shelter, education. They also need to help meet their children's psychological needs. 2. The children need to feel loved and cared for, not neglected. They need someone in times they are sick, sad, frustrated, or feeling bad. 3. Parents also need time for themselves to replenish their energy. They get tired, too. They don't care how difficult their job outside and inside the house is. They tend to hide their struggles and bad feelings so their children would think their parents are all right. Even though some of them are disabled, they still struggle to be a good provider for their children. This relates to the story of a father who has no legs but still does his best to earn a living. He is a father of four and resides in the Philippines. 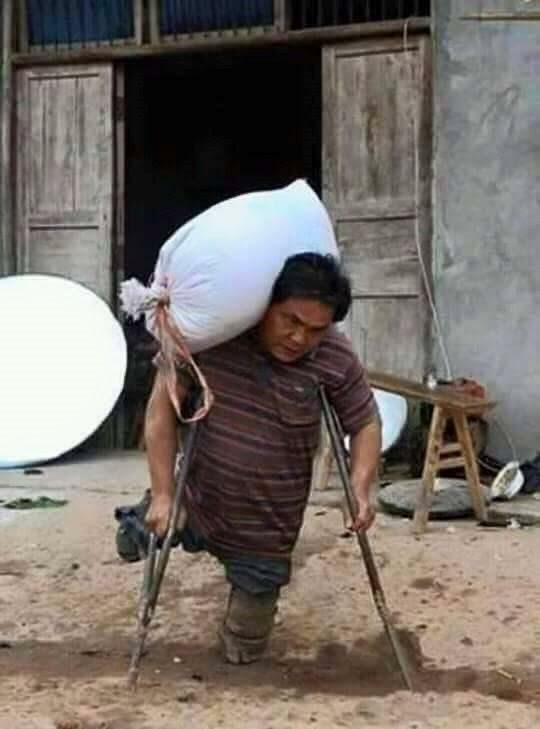 Despite him being a person with disability, he manages to carry sacks on his shoulders as part of his job. He uses his crutches to do his work and daily activities. This story is sourced from Facebook. A testimony that some parents do not think of what others will say about them or their condition as long as they can feed their children. This is also a call for the higher authorities to pass bills that will benefit all persons with disabilities.